Summit View offers a killer combination of stylish comfort and cutting edge decor at a dizzying 2000m altitude and in an unbeatable on-piste location. 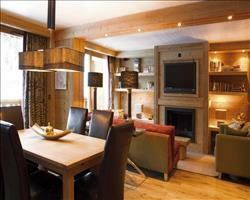 Leman Suite is entirely independent with its own living and dining areas and dedicated chalet host. The decor is tastefully sophisticated, with a boutique-hotel vibe thanks to the luxurious soft furnishings, original works of art, solid oak floors, recessed flat screen TV and BOSE audio system. This La Plagne chalet enjoys an enviable location - a balcony overlooks the spectacular Grand Rochette mountain and the Front de Neige slopes, and an internal lift just outside the apartment's front door takes you down to the piste level, ski school and equipment hire. Spread across two floors, the Leman suite is fantastic for a family or group looking for stylish comfort and luxury. There's two Twin rooms on the Lower level and a Twin and a Double on the Upper level. (Lower level) - Twin with en suite bath, hand basin and WC. Limited space for a cot. (Upper level) - Double with en suite bath, hand basin and WC. Space for a cot. (Upper level) - Twin with en suite shower, hand basin and WC. We update Summit View, Leman Suite's details often, but facilities do change. e.g. some extras listed by the supplier as "free" or included might only be for the first time you use them, or for one time per party, then charged for further use. If any specific feature is essential to your holiday, make sure you ask us to confirm the details of it before you book your holiday. 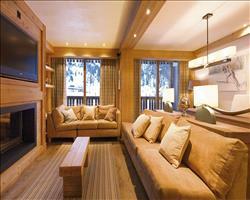 This package holiday to Summit View, Leman Suite in La Plagne, France departs Sunday 29th December 2019, for a 7 night stay on a "catered chalet" board basis. A local tourist tax (Taxe de Sejour or Kurtaxe) is levied by many councils in European ski resorts. It varies by standard and type of accommodation and is age dependent, so not everyone is charged. It's not included in the basic price of your holiday and is usually paid locally. For reference, the average charged in winter 15/16 was between 50p and £2 per person, per night.
. Ask for a quote when booking Summit View, Leman Suite. 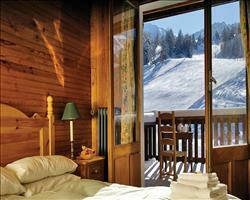 Chalet Hotel Chri... La Plagne France, Gatwick to Grenoble 29th December. As a group I think it's fair to say we are quite demanding ! Megan and Johno coped with this well and provided to our every need. 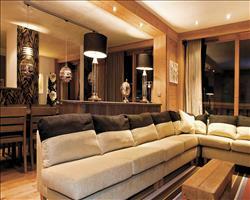 A great holiday in a great chalet. Overall a good holiday, we had a good experience. My only comment would be on the lack of ski hosting opportunities, we only got one day out with the ski host and the knowledge of the mountain was limited. Chloe was absolutely first class in every way and cannot be recommended highly enough. Dinner plates that fit into the dishwasher would make the chalet staff's job a tad easier. Information about the artist Tony Foster and his work would be good to have in the chalet - his pictures are superb and give a great feel to the chalet. You should publish your recipes in a little book - perhaps your chalet staff could sell them to earn a little extra cash! Loved the honesty bar - a great touch. Enjoyed the comfortable bed, crisp bed linen and great pillows/duvet. Chalet staff excellent - wonderful food (including catering very well for my special diet), very friendly, knowledgeable and helpful. Chalet very comfortable, well kitted out and excellent position. Lovely week. Sunshine and snow- great combination. Chalet hosts - Megan and Jono looked after us very well. Super food and very comfortable chalet.